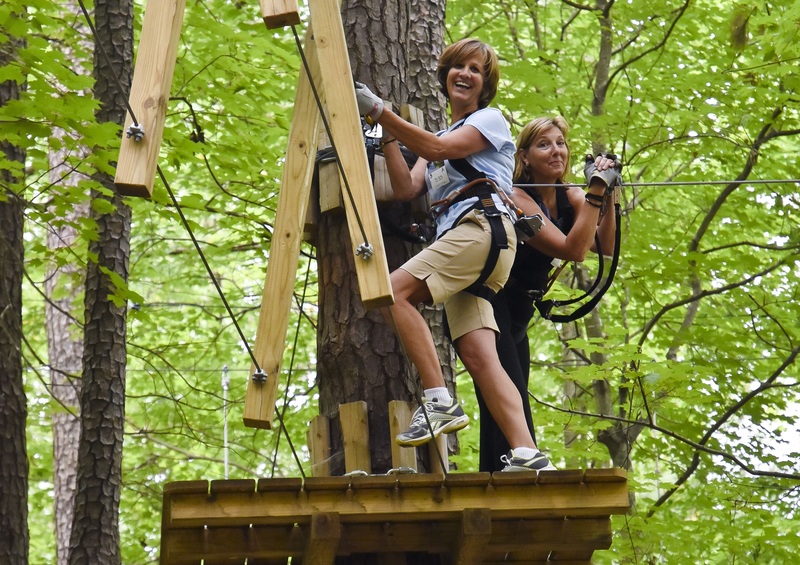 Teachers Climb for Free at The Adventure Park at Storrs, August 13 – 17 for "Teacher Appreciation Days"
Teachers...up in the treetops? Sure! At Teacher Appreciation Days at The Adventure Park. (PRLEAP.COM) The Adventure Park at Storrs, located at 2007 Storrs Road, Storrs, CT, has found a unique way to thank local educators for their contributions to the community while introducing them to the idea that a "climb" at The Adventure Park is "a natural" for school field trips. It is inviting school teachers and administrators to try The Adventure Park themselves, for free, from August 13 – 17, 2018. All that teachers and administrators have to do is reserve their climb online at the Park's website and use promo code TEACHER18 at checkout. Then, when they arrive at the Park to present their teacher ID at the registration desk and they're good to go. Friends and family are welcome to climb along with the teacher at the Park's regular ticket prices. "Educators are such an important part of our community," said Adventure Park CEO, Bahman Azarm, "Climbing is not just fun, it is also an educational activity that supports problem-solving skills, collaborative skills, self-confidence and physical fitness. We want teachers to get to know our Park for themselves. And we are sure they will immediately see its potential for school field trips. Climbing at The Adventure Park the Park is perfect for school groups because it is totally inclusive; we have multiple courses to choose from to suit different ages and abilities." 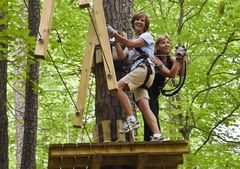 The Adventure Park features a special combination experience of challenge bridges combined with zip lines between the trees that keep people coming back for more. The Park's friendly staff is available to answer questions and assist from the moment customers arrive to the moment they conclude their climb and return home with satisfied "I did it!" smiles. The Adventure Park is not one single aerial treetop trail but a variety of different, color-coded aerial trails of differing challenge levels—beginner through expert—that climbers choose from depending on their age or climbing experience. There are trails suitable for kids, teens, adults and groups. These trails consist of platforms installed in the trees and connected by various configurations of cable, wood and rope to form "crossings" of different kinds including the ever-popular zip lines. Climbers wear harnesses which are doubly secured to safety cables using the Park's "always locked on" system of interlocking safety clips. Before venturing onto the trails climbers receive an interactive orientation and practice session. The Adventure Park at Storrs is designed, built and operated by Outdoor Ventures. For hours and prices click here. 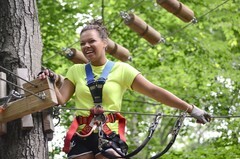 For further details and updates please visit www.StorrsAdventurePark.com, email Info@StorrsTrees.com or call (860) 946-0606.